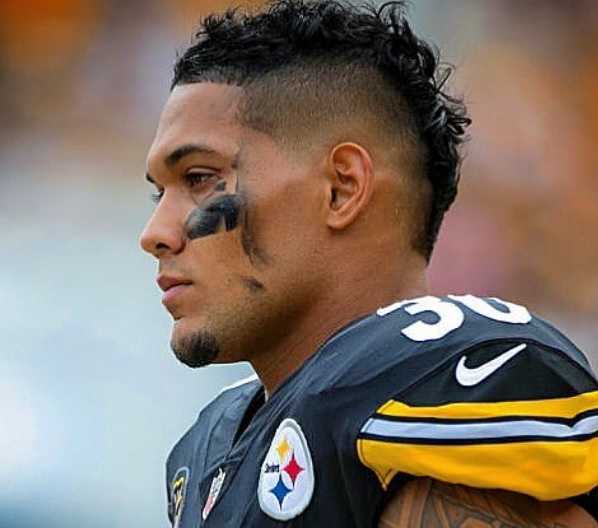 James Earl Conner professionally known as James Conner is an American football running back for National Football League(NFL) club, Pittsburgh Steelers. Conner used to play college football at Pittsburgh. Later, he was signed by Pittsburgh in the third round of the NFL Draft 2017. Conner received AFCA first-team All-American honours and was named the ACC Player of the Year 2014. James Conner puts an amazing performance for Steelers against Cleveland during Week 1 of the 2018 NFL season. Conner had 135 Yards and two touchdowns in the game. Conner was signed by the Steelers as 8th running back as a primary backup for Le'Veon Bell. Despite undergoing MCL twice and recovering from Hodgkin's Lymphoma, it seems like Conner will not step back from giving his best performances on the pitch. Conner was born to a father Glen Conner and a mother Kelly Bibbs on May 5, 1995, in Erie, Pennsylvania, United States. He was raised by his parents. He has four older brothers, Glen, Richard, Michael and Rico. Conner attended McDowell High School in Ere, Pennsylvania. He majored in communications at University of Pittsburgh, Pittsburgh, Pennsylvania. During his high school period, Conner was a running back and defensive lineman on the football team. He decided to play college football at the University of Pittsburgh in August 2012. Connor made his collegiate debut for the Panthers in 2013. Panthers lost the opening season to Florida State. Conner scored his first career touchdown against New Mexico in the following week. He finished the match with 12 carries, 119 rushing yards, and a season-high two touchdowns. Conner achieved a season highest of 26 carries for 226 yards victory over Bowling Green on December 26, 2013. For his outstanding performances, Connor was named the 2013 Little Caesars Pizza Bowl MVP. With 229 rushing yards, Conner broke the school record for rushing yards in a bowl game set by Tony Dorsett. In 2014, Conner started his second year at university rushing for 153 yards on 14 carries. He scored a season-high four touchdowns in the season-opening 62-0 win over Delaware. Conner's performance got better and better. Conner rushed for a career-high 263 rushing yards on a career-high 8 attempts and scored three touchdowns during a 48-51 double-overtime loss to Duke on November 1, 2014. Conner rushed for a total of 1,765 yards on 298 attempts in his second season in 2014. He also set an ACC record with 26 rushing touchdowns. At the end of the season, he was ranked 7th in the FBS and let the ACC. For which, Conner was named ACC Player of the Year. He also received AFCA first-team All-American honours. During his 2015 season, Conner tore his MCL during the Panther's season-opening victory over Youngstown State on September 5. MCL is one of the four major ligaments of the knee. Due to injury, Conner missed his entire junior season. Later, he was also diagnosed with Hodgkin's Lymphoma during the rehab process. He became cancer-free during the off-season. Conner had a slow start to his 2016 season for Panthers due to injury in the earlier season. His attempted 17 carries for 53-yards and a touchdown in the Panthers' season-opener victory against Villanova. 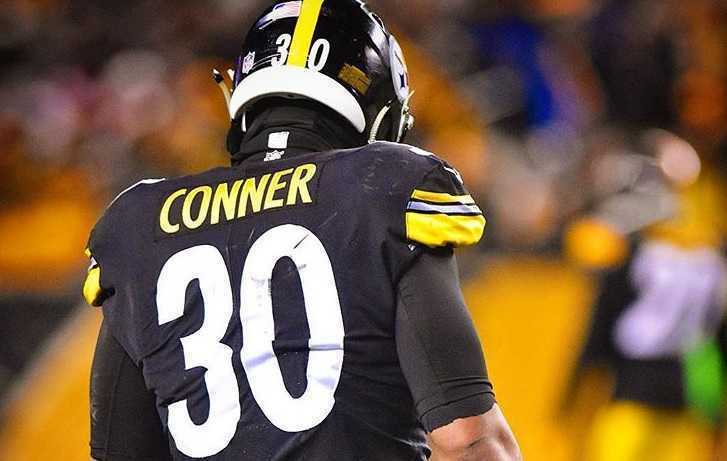 Conner announced via Twitter on December 10, 2016, that he wanted to play for the 2017 NFL Draft as an underclassman leaving his senior year at Pittsburgh. Following his brilliant performances during collegiate appearances, the majority of scouts and analysts projected Conner to be picked in the fifth or sixth round. And he was ranked the 12th best running back available in the draft by Sports Illustrated. NFLDraftScout.com ranked Conner 15th best running back. Then, he attended the NFL Scouting Combine choosing to perform only the 40-yard dash, broad jump, vertical and bench press and completed the three-cone drill, short shuttle, and positional drills at Pitt's Pro Day to finish his combine performance. As a result, The Pittsburgh Steelers selected Conner as eighth running back in the third round (105th overall) of the 2017 NFL Draft. Along with Marshawn Lynch, Von Miller, Dak Prescott, and Tom Brady, Conner beat all other rookies and had top-selling NFL jersey throughout July. And the Steelers signed Conner to a four-year contract on May 11, 2017. Conner came ahead of veterans Knile Davis and Fitzgerald Toussaint for the vacant backup running back position left by DeAngelo Williams. Connor made his NFL debut on September 10, 2017, against Cleveland Browns. He had four carries for 11 yards in his debut game. He played in 14 games as the primary backup Le'Veon Bell, rushing for 144 yards on 32 attempts with no touchdowns. Conner again suffered an MCL injury in week 15. Conner finished his debut season with 32 carries for 144 yards. Conner after tearing his MCL during the Panthers' first game of 2015, he was also diagnosed with Hodgkin's Lymphoma. Despite this, he said he did not fear cancer and promised to return to football again. Conner started attending rehab. Conner faced 12 rounds of chemotherapy to cure cancer. Conner continued to participate in a non-contact drill with the Panthers football team as much as his body would allow during his treatment process. Connor met Kansas City Chiefs' safety Eric Berry, who also overcame Hodgkin's Lymphoma on "The Ellen DeGeneres Show" on April 21, 2016. Eric Berry was inspiration figure to Conner. Cooner announced on Twitter on May 23, 2016, that he was cured and now cancer free. Running back James Conner of Pittsburgh Steeler has earned $1.74 million over his two seasons at Pittsburgh. Conner earns an annual salary of $780,000 and his net worth is estimated to be $2 million. Conner was signed by Pittsburgh on a four years contract on May 11, 2017. Conner overcame Hodgkin's Lymphoma undergoing 12 chemotherapy. Conner came ahead of veterans like Knile Davis and Fitzgerald Toussaint for running back position left by DeAngelo Williams.